I haven't indulged in a spot of Xplory® love for a while - but I had to share these lush new Winter Kits with you all. Extreme consumerism I know but how I wish they'd been around when I still needed a pushchair?! I have been the Stokke® pr for 7 years but my position in the company in no way influences what I write about here on my personal blog. I was a Stokke customer long before I worked for them and the reason that I'm still working for them is that I truly LOVE their products. That said, I may as well give our UK Facebook community a plug! If you like Stokke® and want to be the first to know about new products and news, pop over and 'Like' us! They look oh so good! Probably very expensive! Are those like mittens built into the handles? That's amazing. (I'm a non-mum, but I know cosy when I see it!). I love the winter kits and I want one on my super purple Xplory! Hand warmers are just ace. Fact. Gorgeous. And excellent timing as I've just spent the last few days pushing an Xplory along the beach. Fabulous stroller. We can't praise it enough. I'm a pushchair addict and haven't tried a Stokke, despite adoring my tripp trapp.. Could the time be now?! Oh beautiful my 4 year old may not fit however! Hi, can someone tell what's the difference between the old winter kits and the new ones? I heard (and saw) the new ones have some extra padding and are warmer. But it's very hard to get the new one because lot's of retailers still sell just the old ones. They won't be selling the new ones until they sell them all! My question is, why they ask same money for the old ones when it's a lot thinner? @Jana Hamarova, The new winter kits above don't have any differences except for the colour. 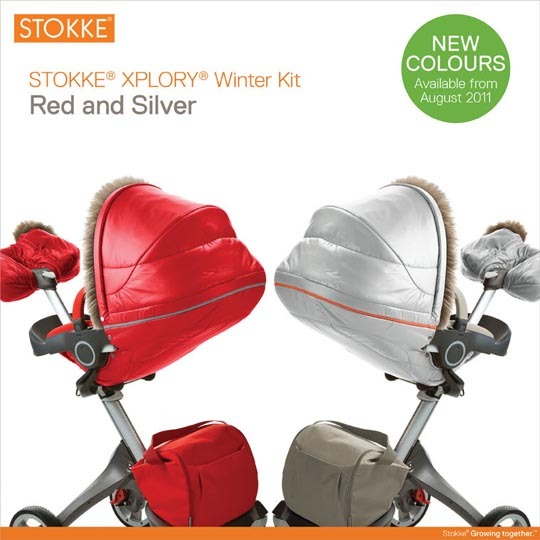 I have just confirmed this with the Stokke global marketing manager. A saw a few comparing images of both and they are different, two friends of mine bought the same winter kit from the same retailer, one got a new kit 2011 and the other one got the old one, it can be easily recognized by the box. They are both different. The old storm cover has no lining at all, but the new one has new cotton checked lining inside of the storm cover. Any ideas why is it like this? And why are they same price? I want to buy a new winter kit but it looks like no retailer will give a guarantee that I will get what I exactly want. Did your friends both get the same colour winter kits? Were they purchased at the same time? Yes, they got exactly the same color Purple. First one ordered on 3rd Sept, came on 26nd Sept that was the new one 2011. Second ordered on 5th Sept, came on 14th but they sent wrong color (Navy), so it went back and came on 27th Sept and it is the old one. Please excuse my grammar and typo, it's after midnight here :) time to go sleep I guess..